While the Second World War rages around the globe, personal dresser Norman is fighting his own battle in the backstage rooms of a regional theatre. Nothing - not the falling Nazi bombs, the air raid sirens, the scarcity of suitable male actors, nor the precarious mental state of their leading man - is going to stop him from making sure that Sir goes on stage tonight as King Lear. Proving that "there's more drama off-stage", this painfully funny tragicomedy is a real exercise in Keep Calm and Carry On. Reece Shearsmith brings great depth of character to Norman, a slightly effete dresser, yet a hardened veteran of the slings and arrows backstage. Armed with hangers and a sardonic wit, he sashays about the dressing room doing impersonations. He treads a delicate line between steely determination and "softly softly" to coax the faltering Sir through make-up, hair and costume, his exasperation just about concealed, albeit with a generous slug of brandy. 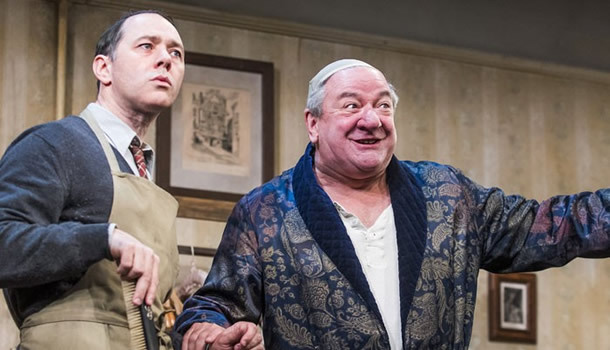 Ken Stott cuts a tragic figure as Sir, a man who seems to have depression creeping in at the corners. He yo-yos between pitiful despair and snarling irascibility; Just changing clothes is a Herculean effort, and he seems woefully unready to go onstage as anyone (although he has a good go at prepping for a performance of Othello, to darkly comic effect). Harriet Thorpe as Her Ladyship is the consummate diva: devastatingly dramatic, her caramel-smooth musical tones hint at a woman who is married to her profession and seems blissfully unaware that she is decades too old to play Cordelia. Another misfit in a cast of "cripples, old men and Nancy boys". Phoebe Sparrow brings great naivety to the young Irene: how easy it is to get caught up in admiration for the stars, only for them to abuse their position. Sir's lecherous gaze is skin-crawlingly vile. There are wonderful cameos from Simon Rouse as the nervous Geoffrey Thornton (resplendent in a jingly jester costume), and Adam Jackson-Smith as Oxenby, a would-be matinee idol (were it not for the leg injury). The highlight is certainly at the opening of Act 2: a pastiche of Noises Off-esque farce as the cast and crew pace about the wings, desperately trying to summon the fragile Sir to the stage with some valiant ad-libbing (not easy in iambic pentameter). To add insult to injury, they've also been joined by German bombers overhead. But through Norman's persuasion, we finally get a performance (although it's possible that not all of it is from King Lear). Yet Norman has made a career out of living in Sir's light - by slithering in the upper echelons of theatrical society, he has a rather inflated sense of self, and Shearsmith's performance has echoes of Tom from Downton Abbey. By putting all of his eggs in one basket, he has rather isolated himself from his peers, much to his cost. His final scene seesaws between pathetic and malevolent to heartbreaking effect.